Sedgwick Park House is a privately owned home, set within 100 acres of rolling countryside and the gardens and ground floor are occasionally open to the public. The gardens include breathtaking views of the South Downs and Chanctonbury Ring. The house in its current state was built by Mr and Mrs Robert Henderson, and was completed in 1886, to a design created by Ernest George and Harold Peto. The House was purchased by John and Clare Davison in 2001 and the Estate at the moment comprises of the house with meadows to the front, formal gardens to the rear, and the woodland site of Sedgwick Castle to the West. Two and a half miles E. from Horsham was one of the minor castellated buildings, intended for occasional resort. It was an entirely independent castle, belonging for two and a half centuries after the Conquest to a Norman family of the peculiar and somewhat opprobrious name of le Salvage, or Sauvage “the Savage.” Robert le Salvage possessed lands of his own, and others he held under the Braoses of Bramber, to which family it seems, from the similarity of their arms, he was related, and most of his successors were called Robert. The only child of the fifth Robert le Salvage was Hawina, who brought Sedgwick to her husband, John de Gaddesden, and died towards the end of the reign of Henry III. The lands seem to have continued in the family of le Salvage till 1292, when John le Salvage exchanged them with William de Braose for other lands, and the manor passed to his son William, who, dying in 1326 s.p. 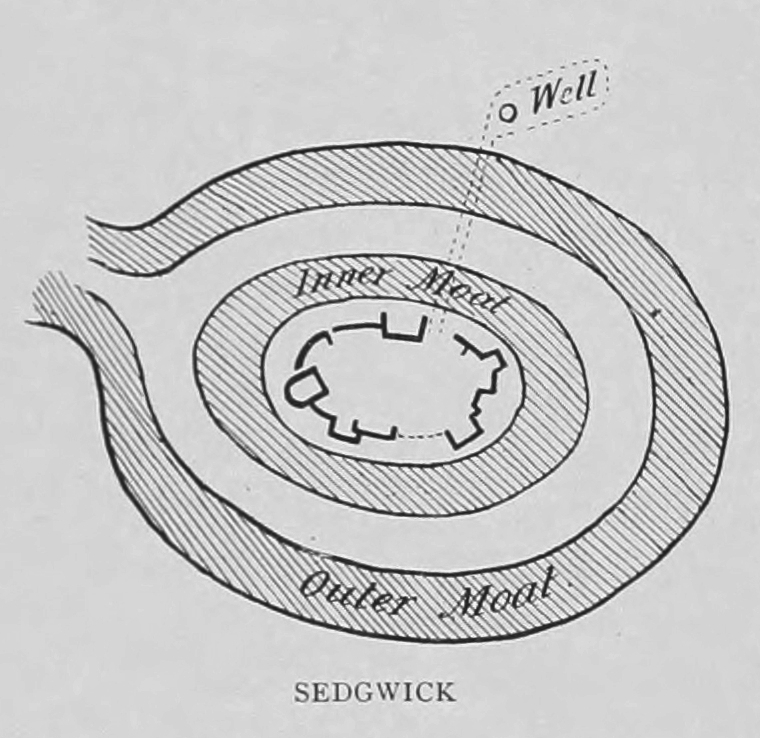 male, the Braose lands were divided, Sedgwick passing through the hands of several families, until they came to the De Mowbrays by the marriage of Aliva de Braose with John de Mowbray, and continued with them and the Howards till the attainder of Thomas, fourth Duke of Norfolk, in 1592, when they were granted to Sir Thomas Seymour. He was attaintcd two years later, when Sedgwick was conferred on Sir Thomas Fynes, and then it passed to the Caryls, of Shipley and Ladyholt, who held it under the Crown till 1705. It was then purchased by Sir Thomas Bennet, Kt., who, after improving the property, sold it to Charles, Duke of Richmond, at whose death, in 1750, it was bought by Mr. Joseph Tudor. He, dying in 1786, bequeathed Sedgwick to his nephew, William Nelthorpe, whose nephew, J. Tudor Nelthorpe, is the present possessor. It cannot be known when the castle was allowed to fall into decay ; perhaps in Braose days, as that family possessed many residences. The form of the castle was circular, the walls being surrounded by two moats, and rising directly from the edge of the inner one, which is 200 yards in extent. These walls remain to a height of 4 or 5 feet from the bottom of the moat in a tolerably perfect state, except on the E. side, where the stones have been taken away for mending the roads. Thirty yards beyond the outer moat is a fine basin of masonry, called “the Nun’s Well,” which supplied water to the castle, on the N.W. of which is an outlet to the road leading to this well. The S.E. approach to the castle still remains. Dallaway says that the foundations are traceable everywhere, and some of the apartments can be made out, especially one of hexagonal shape.